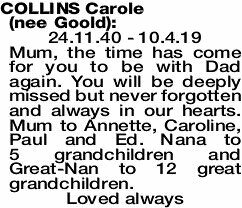 24.11.40 - 10.4.19 Mum, the time has come for you to be with Dad again. You will be deeply missed but never forgotten and always in our hearts. Mum to Annette, Caroline, Paul and Ed. Nana to 5 grandchildren and Great-Nan to 12 great grandchildren.